The Catholic G.K. Chesterton Society is urging Irish Facebook users to vote against legalising abortion. A British religious group with links to the American anti-abortion movement is paying to target ads at Irish Facebook users, urging them to vote against legalising abortion. Next month Ireland will hold a referendum on repealing the Eighth Amendment, the section of the constitution which makes abortion illegal in almost all circumstances. 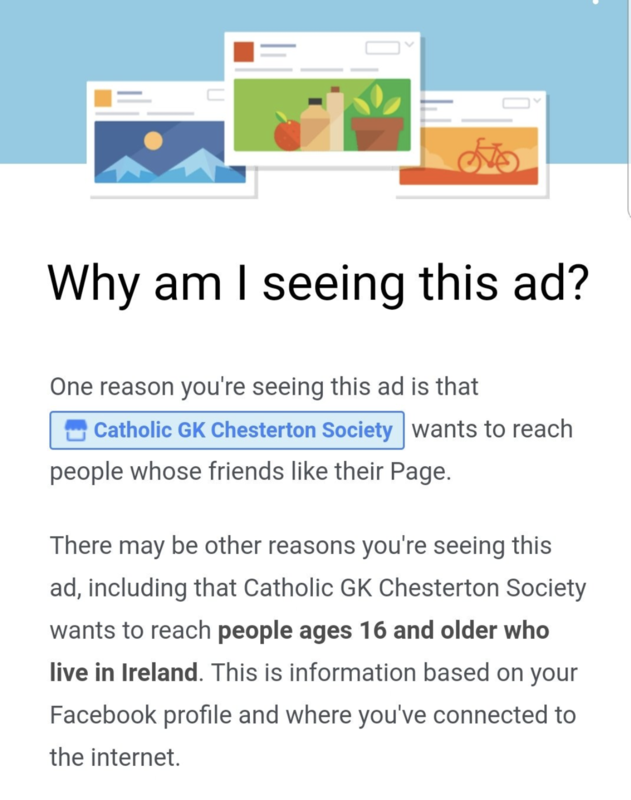 According to the "Who Targets Me" tool, a piece of software used by independent Irish transparency advocate the Transparent Referendum Initiative, the Catholic G.K. Chesterton Society, a small religious group based in the UK, paid for a Facebook post that encouraged against voting to repeal the Eighth Amendment, to reach "people ages 16 and over who live in Ireland". On its website, the Catholic G.K. Chesterton Society says it is "not a society" but "merely a website to promote prayer to the said G.K. Chesterton," a British Catholic writer who died in 1936. However, since 2012, it has also been an active supporter of 40 Days for Life, an international anti-abortion movement which began in the American state of Texas in 1998. And as recently as December 2017 it held a Facebook event on behalf of 40 Days for Life, urging supporters to pray for the closure of UK abortion clinics. While electoral guidelines in Ireland prohibit foreign organisations from spending money on campaigning in a local referendum, or from making financial donations to an Irish campaign group, these rules do not cover social media, meaning a foreign group can legally pay to target Irish Facebook users with content relating to the referendum. There is mounting concern that the powerful anti-abortion movement in the United States, which has publicly lobbied Irish prime minister Leo Varadkar to retain Ireland's strict abortion law, could exploit the lack of limitations on social media campaigning to influence the outcome of May's abortion referendum. 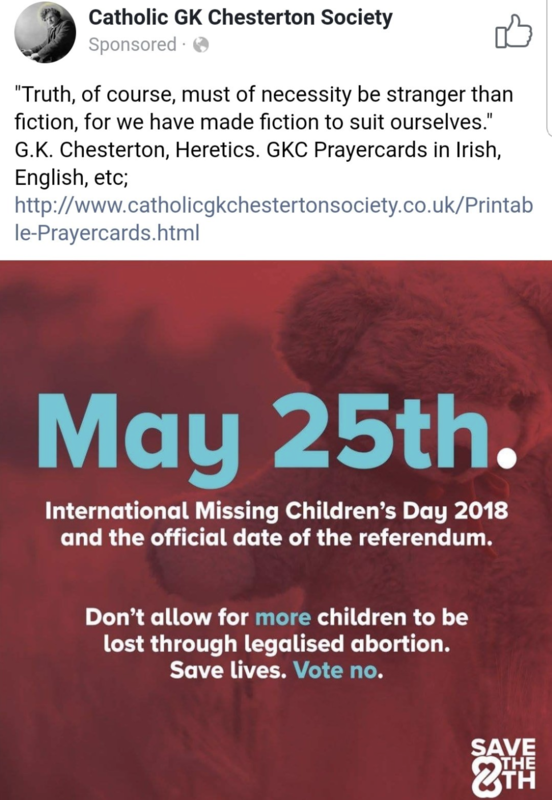 The targeted post includes an image which states the date of Ireland's abortion referendum, 25 May, and notes that this is also the date of International Missing Children's Day. "Don't allow for more children to be lost through legalised abortion," the image text reads. "Save lives. Vote no." The image also contains the logo for Save the 8th, one of the leading Irish campaigns against legalising abortion. The same image has also appeared on Save the 8th's Facebook page. Chesterton inspired the American Chesterton Society, and is celebrated by the American Episcopalian church as well as the wider anti-abortion movement. There have been calls from some religious groups to make Chesterton a saint. The post text contains a quote from G.K. Chesterton, and a link to prayer cards, which include a "pro-life" option, the text of which includes a link to the UK anti-abortion group, the Good Counsel Network. GCN, also a strong affiliate of 40 Days for Life, was this week banned from holding prayer vigils outside an abortion clinic in London. The local council issued a Public Space Protection Order following claims by local residents that women entering the clinic were routinely harassed by volunteers from GCN and other groups. GCN denies the allegations, stating that a direct approach is integral to encouraging women not to go ahead with abortions. Clare McCullough, the founder of GCN, has appeared in images posted to the Catholic G.K. Chesterton Society Facebook page. McCullough told BuzzFeed News that Catholic G.K. Chesterton Society was "little more than a website, a prayer card and an annual pilgrimage", and that any American connection was "imagined". She later told BuzzFeed News that her husband, Stuart McCullough, runs the Catholic G.K. Chesterton Society and paid for the advert. She said: "He did indeed boost that post, with his own money. Not Good Counsel's. He spent £10 boosting the post. I don't really know how he managed to save that up, because he usually spends all his money on books. Chesterton books mostly. But I can ask him if he took it out of his piggy bank or whether it fell through the hole in his pocket and got stuck in the lining of his coat if you want." A spokesperson for 40 Days for Life declined to comment. While legislation that would seek to place tighter controls on social media campaigning has been proposed by the Irish government, the relevant changes would not come into effect before May's referendum on abortion. "In Ireland we do not allow outsiders to donate to campaigns that are working to influence voters – we believe that legally binding changes to our constitution should be a matter for Irish citizens to decide," Liz Carolan, cofounder of the Transparent Referendum Initiative told BuzzFeed News. "Unfortunately, the rules have not kept up-to-date with technology. We live in a world where actors outside of Ireland can – and indeed do – directly purchase access to Irish voters, and they can do it in ways that are difficult to detect and not open to scrutiny," Carolan continued. "This is why we need reform of our rules to reflect the reality of campaigning now, and why we need the companies providing advertising space to at a minimum allow Irish voters and authorities to see who is targeting Irish citizens with political content." Who Targets Me was created by Sam Jeffers and Louis Knight-Webb. An earlier version of this post stated it was created by the Transparent Referendum Initiative – which makes regular use of the tool.